← The Up! House is Real! One can never have enough libraries…large or small. 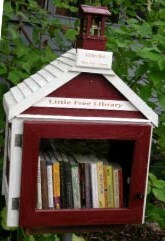 We have one of these tiny libraries outside the Free Bird Espresso stand on 2nd Street in Okanogan, WA. That’s so true! I love discovering these little libraries all around…it’s so cool to see the wide variety of styles.